quantity: 250 pcs asst styles asking: $6.00 wholesale: $12.00 style no. : 276006/536000 description: Bracelets - available in 2 asst styles. 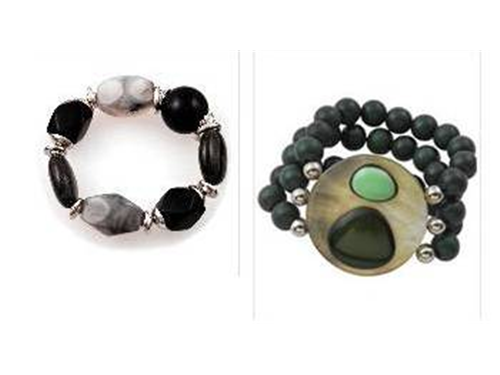 Smoke - Black and grey ceramic beads separated by metal tone separators; stretch bracelet (100 units). Inspired - Lightweight wood beads with shell; stretch bracelet (150 units). Fits most wrists. Packaged in clear plastic bag. Faux velvet jewelry bags available for packaging.